Have you ever really wanted a food that you’ve never even had before? It’s like a weird calling of sorts. Well, this sandwich called out to me. I wanted to make this caprese sandwich, never having had one before. In fact, I’ve never had caprese anything. Normally it’s a salad, but I’ve never eaten it. Even though I can’t explain why I wanted this sandwich, I made it. And it was delicious. Thick, chewy bread, fresh tomatoes, fresh mozzarella, fresh basil, and reduced balsamic vinegar all sandwiched together in deliciousness. This sandwich is really fresh and flavorful. I can’t recommend this enough. Not only is it delicious with the tomato bisque, but it would be delicious with just about anything. This sandwich requires very little cooking to make it. However, it does require a balsamic reduction. 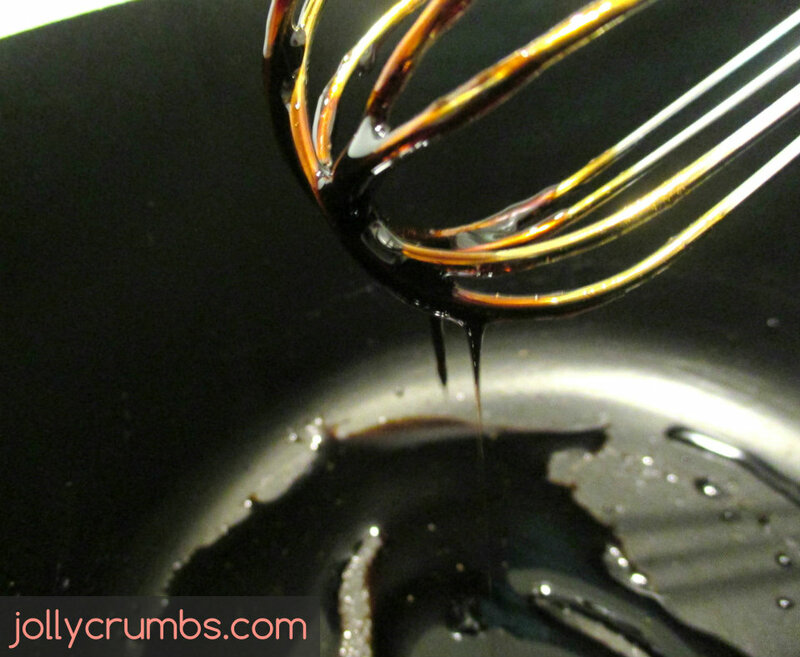 I reduced 1/2 cup balsamic vinegar, but you could use less or more depending on how much you want to use. It will reduce by at least half, so keep that in mind. Place the balsamic vinegar in a small sauce pot. Bring the vinegar to a simmer over medium low heat. Lower the temperature so it’s at a lower simmer. Simmer for 10 to 15 minutes, stirring occasionally. You don’t want the temperature to be too high or it will burn the vinegar. Let the balsamic cool off the heat in the pan. It will thicken as it cools, so don’t worry if it looks thin still. I started to assemble my sandwiches once the reduction was cool. I sliced the ciabatta bread into portions for sandwiches. You can use any thicker, hearty bread for these paninis. I love ciabatta bread for paninis so that’s what I went with. Once you have the bread portions, slice them in half so you have a top and a bottom to the sandwich. Slice some fresh mozzarella and tomato for each sandwich. You can use as little or as much as you’d like to. I don’t really think there can be a bad amount of fresh ingredients on these sandwiches. I used fresh, organic basil on these, but you can use whatever kind of basil you like. You will just need a few leaves for each sandwich. Once the ingredients are prepped and ready, start by drizzling or spreading the reduced balsamic vinegar over half of the sliced bread. Use as little or as much as you’d like. Place the mozzarella on each sandwich. Top with basil and tomato slices. Place the top of the bread on the sandwich. 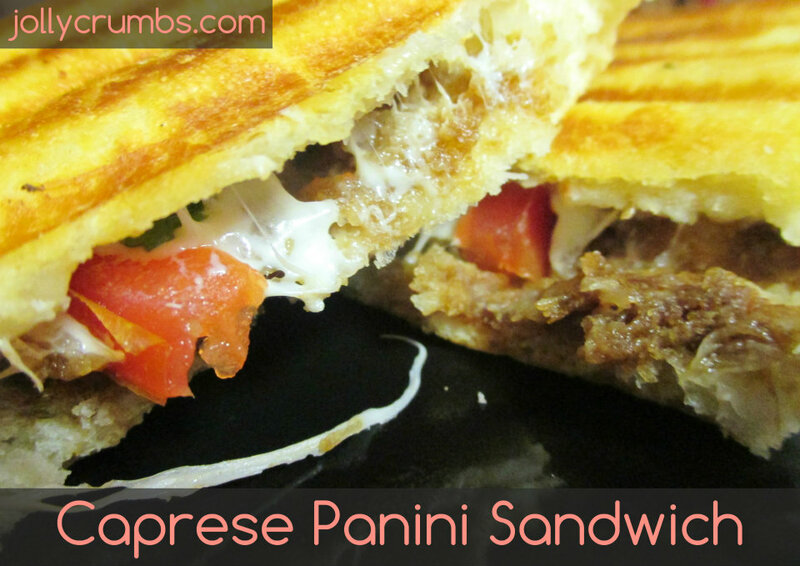 Now, you can make these paninis with a few different techniques. I use our George Foreman grill to make these, but if you don’t have one you can use a panini press or even a skillet. If you have a grill or press, spray the top and bottom of the sandwich with nonstick cooking spray, no calorie spray butter, or just grease with butter or margarine. Place the sandwich in the hot grill or press and heat until the outside is golden brown and inside is melty. If you don’t have a grill or a press, here is a method that will work the same for you: Heat a large skillet over medium heat. Place the sandwich in the pan once it is hot. You will need a pan to set on top of the sandwich that is weighed down with something else. For example, place a small sauce pot with a sack of flour in it on top of the sandwich. This will press the sandwich down so it gets a nice crust on the outside. This is a very easy sandwich to make, but it is impressively yummy. Not only can you be fancy and say you made your own balsamic vinegar reduction, you can make a delicious fresh sandwich within minutes. I am not typically a fan of raw tomatoes. However, on this sandwich they are perfect.I was also slightly worried about using whole basil leaves. You have no idea what you are missing. The tomatoes, mozzarella, and basil combine together to create a flavor explosion. If you are worried about not liking this sandwich because of an ingredient or two, try this anyway. You will be amazed! Place balsamic vinegar in a small sauce pan. We are going to reduce it down. Bring to a simmer over medium low heat. Lower the temperature so it is at a low simmer. Simmer for 10 to 15 minutes, stirring occasionally. Let the balsamic cool off the heat. It will thicken as it cools. Slice your bread into sandwich-sized pieces. You can cut whatever size you want, I stuck to 100g portions. Cut the bread portions in half so you can make a sandwich. 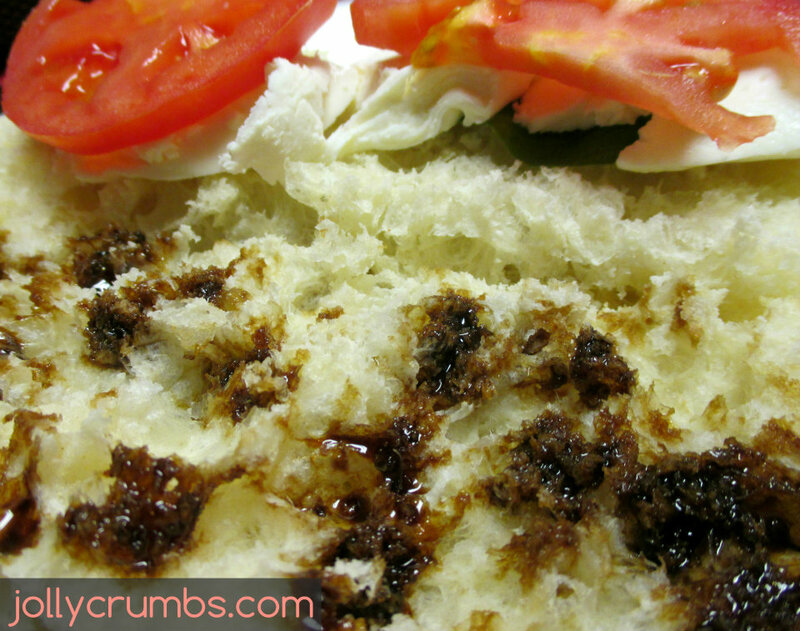 Drizzle or spread the reduced balsamic vinegar over half of the bread. You can use as little or as much as you want to. Place 1oz of the mozzarella on each sandwich. Top with two basil leaves and two slices of tomato. Either using a panini press, countertop grill (George Foreman), or skillet- put the heat on medium. Spray or spread both sides of the sandwich with one of the options listed in the ingredients. Place the sandwich in hot the press, grill, or skillet. Grill on both sides until golden brown and crispy. The inside should be melted and hot. *If you are using the skillet, you will need a pan to set on top of the sandwich that is weighed down with something else. For example, place a small saucepot with a sack of flour in it on top of the sandwich. This will press the sandwich down so it gets a nice crust on the outside. The goal is to make a panini. You can use any thick, hearty bread for this sandwich. 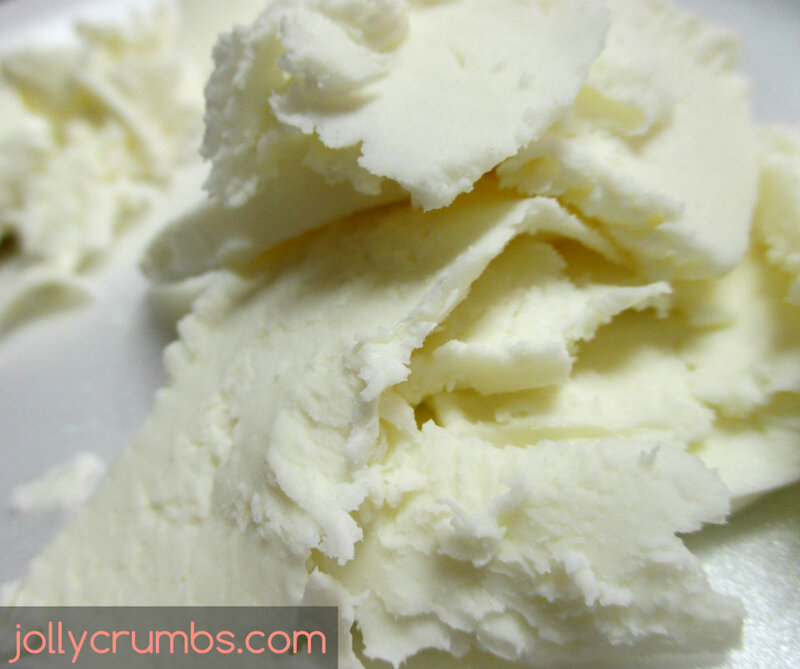 You will want something thicker that holds up well to being smooshed. I love ciabatta bread for paninis, but anything thick would work well.